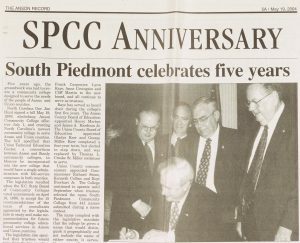 Crossroads, the newspaper of Belmont Abbey College, is now digitized on DigitalNC. Courtesy of our partner Belmont Abbey College, 44 issues are available to browse beginning with the very first off the press in November 1971. This collection spans from 1971-1979 with issues published every other month. 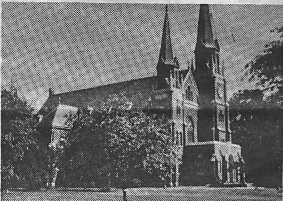 Belmont Abbey Cathedral as seen in the July 1973 issue of Crossroads. Belmont Abbey College lies just west of Charlotte in Belmont, North Carolina. Crossroads was established to serve its students, faculty, and administration by providing information about campus activities. It covered issues affecting the college as well as more general issues in higher education. As a Catholic and Benedictine college, the newspaper’s editorial board supported Christian values and worked to uphold “Christian ethics, good taste, and journalistic quality” (Crossroads, November 1971, p. 2). Among the news headlines are graduations, alumni news, fundraising campaigns, appointments of new abbots, and changes on campus reflective of this decade’s larger cultural movements. The first computer came to campus in 1968 and, in 1971, Crossroads featured an article charting the college’s subsequent adoption of new technology. Image of Belmont Abbey’s first female student as seen in the September 1972 issue of Crossroads. Co-education became another major turning point on campuses across the nation in the 1960s and 70s. 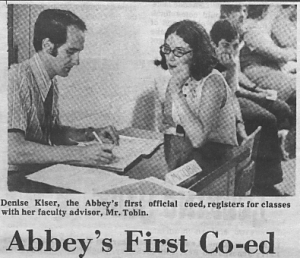 Belmont Abbey’s first female student enrolled in the fall of 1972. This decision “broke a ninety-six-year tradition,” declared a March 1972 article. 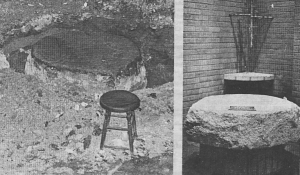 Image of Civil War era slave block-turned baptismal font as seen in the July 1973 issue of Crossroads. To read about these and many other events in the issues of Crossroads, click here. To see additional materials from our partner, Belmont Abbey College, visit their partner page. New photographs of damage from 1954’s Hurricane Hazel, provided by Braswell Memorial Library, are now online at DigitalNC. These photos show some of the damage from the Category 4 storm in Dortches, North Carolina, just northwest of Rocky Mount in Nash County. Most of the photos are of the house belonging to Sidney H. Shearin, and you can even see before and after photos of his home. 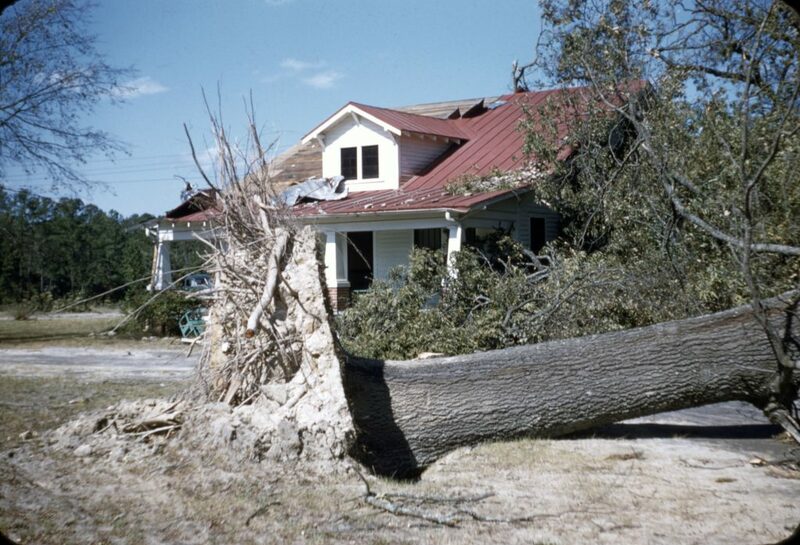 Hazel brought wind gusts of around 120 mph to cities like Goldsboro and it caused heavy tree damage throughout the state. The NOAA says that in North Carolina alone, around 39,000 buildings were damaged, and a few are shown in this collection. 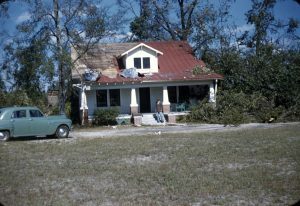 To this day, it is the most destructive hurricane to ever hit the state. To check out the new photos, click here. To learn more about Braswell Memorial Library, visit their partner page or take a look at their website. The last batch from a set of photos contributed by the Benson Museum of Local History is now up on DigitalNC. We embarked on this digitization project in 2015, and the complete set of over 1000 images is now available. Benson is a town located in Johnston County with a current population of around 170,000 people. This last batch includes photos of historic Benson residences, Benson businesses, and portraits of Benson community members. 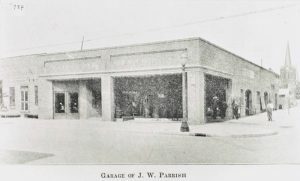 The set as a whole is comprised of a wide range of images documenting many aspects of life in Benson. The collection includes photographs of events like the State Annual Singing Convention and the Benson Mule Day Parade, as well as images of less formal group gatherings, such as family barbecues, school events, and church groups. Also included are class portraits, family portraits, individual portraits of town members, street scenes, photos of businesses, churches, homes and more. 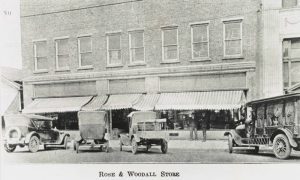 Most of the photographs date to around the 1920s, but the collection includes photos from as recent as 2003 and photos dating as far back as 1870. Click here to browse through the complete set of photographs. To read previous blog posts documenting additions of new batches along the way click here. 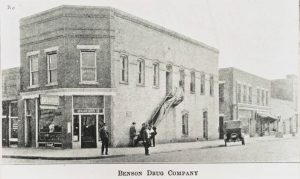 To see more materials from the Benson Museum of Local History, please visit their contributor page. To learn more about the museum and plan your next visit, please their homepage. Three new scrapbooks from the Rocky Mount YMCA provided by Braswell Memorial Library are now online at DigitalNC. These scrapbooks collect newsletter information, newspaper clippings, and documents about the Rocky Mount YMCA. One scrapbook contains newspaper clippings from August 1935 to August 1937, the second has clippings from August 1937 to March 1939, and the third has photos and newsletters from 1936 to 1954. Many of the newspaper clippings celebrate the local YMCA teams and their achievements. They had softball, baseball, basketball teams, and more for boys and girls alike. 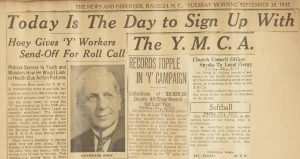 The scrapbooks also contain newspaper articles about local events, YMCA educational programs, and visits by important figures, including the North Carolina Governor at the time, Clyde Hoey. To check out the scrapbooks, click here. To learn more about Braswell Memorial Library, visit their partner page or take a look at their website. Photo in the 14th Street School scrapbook showing classes in front of the school. 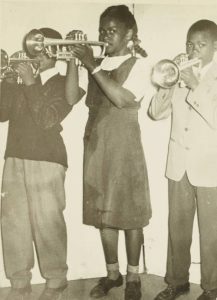 Practicing trumpet for the school band in the 14th Street School Scrapbook. A batch of new materials from Forsyth County Public Library are now available on DigitalNC. 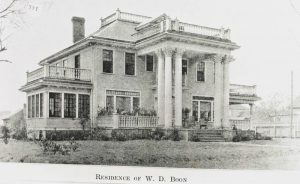 Included are two scrapbooks, one from the 14th Street School in Winston-Salem and one from the Society for the Study of Afro-American History in Winston-Salem. Also included are materials from the Malloy/Jordan East Winston Heritage Center and the East Winston Branch Library, and yearbooks from St. Anne’s Academy and Atkins High School. The 14th Street School educated African-American students in Forsyth County from its founding in 1924 through the 1970s. This scrapbook collects photographs of student activities and events. Included are photographs of sports teams, the school band, dance performances, and class portraits. The 14th Street School acted as a community hub and created lasting bonds within its student body which remain strong to this day. Despite its closure, alumni continue to hold reunions and advocate for the school as an important part of Winston-Salem history. Additionally a scrapbook from the Society for the Study of Afro-American History in Winston-Salem (now called the Society for the Study of African American History in Winston Salem) collects calendars created from 1989 through 1997. These calendars include images and write-ups of Winston-Salem history and events as well as photographs and information about Society events. A page of the 1989 calendar by the Society for the Study of Afro-American History showing a reunion of the 14th Street School classes of 1931-1939. The Maroon and Gold 1948-1949 yearbook from Atkins High School and The Annette 1952 yearbook from St. Anne’s Academy are also now available. 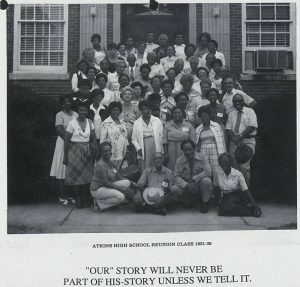 Atkins High School was founded in 1930 for African-American students in Winston-Salem. The school was named for Dr. Simon Green Atkins, the founder and first president of Winston-Salem University. Dr. Atkins was born into slavery in 1863 on a farm in North Carolina but was able to receive a public education after the end of the Civil War. He went on to attend St. Augustine College and subsequently dedicated his life to improving education for African Americans. To see these and the other items from this batch of materials, visit the links below. To see other materials from Forsyth County Public Library visit their partner page or take a look at their website. 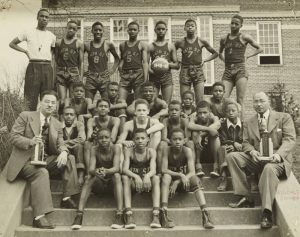 The 1948-1949 14th Street School basketball team as seen in the scrapbook. 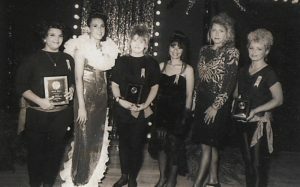 Winners and models from the 1993 Spring Hair Show. 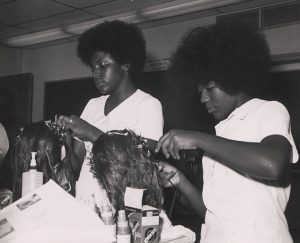 Club members practicing on wigs in the 1973-1974 scrapbook. 9 scrapbooks provided by our partner Southeastern Community College document the Cosmetology Club at Southeastern Community College from the 1970s through the early 2000s. Southeastern Community College is located between Chadbourn and Whiteville in Columbus County, North Carolina. Southeastern Community College currently offers a cosmetology degree program and sponsors a cosmetology club open to all cosmetology students. Current club activities include educational programs, trips, social events, and more. The club’s history is captured through these 9 scrapbooks. The scrapbooks contain photographs, news clippings, and programs pertaining to the club. Events like the annual Spring Hair Show as well as educational demonstrations and club officer elections are covered. The fun photographs in these scrapbooks show the evolution of popular hair, makeup, and beauty trends through the decades, and give a behind the scenes view of how iconic looks are put together. Club members, who put long hours into learning the latest styles, often practiced hair or makeup techniques on themselves or each other, making for some fabulous photos. To see more materials from Southeastern Community College, visit their partner page or take a look at their website. 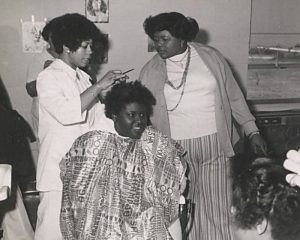 A hair styling demo seen in the 1977-1978 scrapbook. 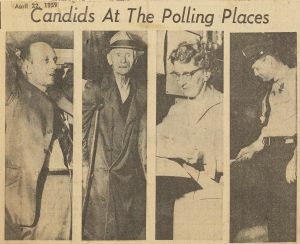 A news clipping from April 22, 1959 shows residents of High Point at the polls for a local election. Four new High Point scrapbooks from our partner, the Heritage Research Center at High Point Public Library, are now available at DigitalNC. These scrapbooks, dating from 1959-1962, join previously digitized volumes dating back to 1952. The scrapbooks contain news clippings primarily from the High Point Enterprise and Greensboro Daily News. The clippings are arranged in chronological order, and in many cases articles were pasted into the scrapbooks in an overlapping fashion so taking multiple images of each page was necessary during the digitizing effort. A slew of excited headlines marked the introduction of a flight route from Chicago to the High Point-Greensboro Airport. 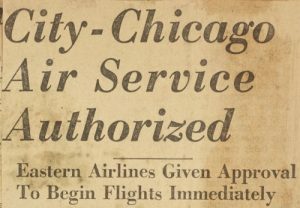 This headline is from April 14, 1959. Clippings in the scrapbooks pertain to goings on around High Point and Greensboro including coverage of local political races, decisions about town planning and development, civic initiatives, special events, and advertisements for local businesses. There is a particular emphasis on municipal issues such as land annexation and zoning. To see more materials and learn more about the Heritage Research Center at High Point Public Library visit their partner page or take a look at their website.